This is our official list in search of the best LED lanterns on the market today. Scroll further down for full details on each product and more info on the benefits and specs of LED lanterns. Finding the best LED lanterns can be rather difficult. These lanterns are not just a necessity for campers and people who enjoy the outdoors. They are crucial to families and households in times of crisis or emergency. These lights can be a lifesaver. In the outdoors, they need to be bright enough to clear as much darkness as possible to ward away fear. There are five options that are better to pick over other models, but there are a few criteria to look for first. The Etekcity Outdoor LED Camping Lantern is ultra-bright as it runs on 30 individual low powered LED bulbs. This design is meant to lengthen the lantern’s lifespan. As an added benefit, the LED lights are positioned in a 360-degree arrangement, so it offers multidirectional lighting. The brand also produces a rather durable product which is constructed to be equivalent to military grade products. The Streamlight 44931’s Siege Lantern runs on C4 LEDs, and one red C4 LED for the sake of night vision. It is also ergonomically designed to lock in an upright or stored position. The red C4 LED option helps with low light situations to avoid eyes becoming tired. It provides softer light due to the casing surrounding the lights. Coleman’s Quad LED lantern is made of four, individual light panels that snap into a single lantern design. 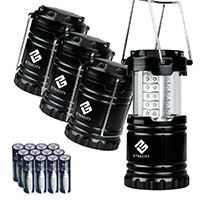 This lantern is rather durable, more so when compared to other models mentioned thus far. The top handle of the case is meant for easy carrying, and while it does not come with a D-Ring, it can still be hung from various surfaces through the handle provided. This model does come with a rechargeable base to make for easier control over battery usage. HeroBean’s LED Lantern V2.0 comes with an additional flashlight function when in a collapsed mode, though it might not be needed with how functional this lantern is. It is made based on older technology with the LEDs – a total of 30 – formed into a trio of locked-in panels that allow for 360 degrees of illumination. Gold Armour’s Brightest Camping Lantern puts out a great deal of illumination for its size. It uses the latest chip-on-board technology to provide more illumination in a given area. The light is warmer in color, making it easier on the eyes because it avoids colder, harsher lights, which can disrupt sleep cycles and entice bouts of insomnia. There are much more LED lantern options available for purchase, but most of them do not meet the quality the models mentioned here present. Lumens are extremely important for the most illumination possible, which makes the Brightest Camping Lantern by Gold Armour one of the best LED lanterns because it puts out so many lumens at 300. These models are all durable and energy efficient, so they could suffice well in any outdoor situation and even in emergencies.